Abstract Certification programs has been employed in many agricultural products as a means to encourage and communicate compliance with standards associated with various attributes, such as organic, fair-trade, GMO free, and eco- friendly, among others. Such programs further seek to provide added value, through a price premium, to producers and supply chain actors associated with the label. In this paper, we review a number of global labeling and certification programs that could add value for coffee farms in India through the promotion of conservation and environmental protection. We provide results from a survey conducted on a sample of coffee farms in Coorg district, India to assess their awareness and perceptions related towards certified coffee and environmental conservation in general. Survey results illustrate strong positive associations with the environment by coffee planters, particularly among certified and organic producers. However, price premiums for certified and organic coffee are relatively small. 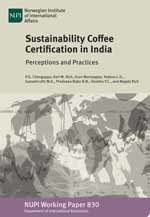 While the potential of conservation-oriented certification for coffee in Coorg could be relatively limited outside of a few individual-level niches, branding Coorg more generally as a conservation-oriented region could hold promise, lever- aging and personalizing the uniqueness of the natural offerings from Coorg and tapping into burgeoning associations with place and region in India.